After your move, we will systematically unpack and set-up your home. We will use our experience and knowledge of best practices to quickly and efficiently get you settled. We will consult with you prior to unpacking to ensure your preferences are incorporated into the process. You are welcome to be as involved as you like throughout. WHY LET US UNPACK AND SET-UP YOUR NEW HOME? For professionals and families in transition, we unpack and organize the contents of your moving boxes in a matter of hours. Getting settled in quickly means you can concentrate on work responsibilities, getting kids settled and resuming your normal routines. We can unpack and organize your home faster, easier and more efficiently given our experience and knowledge of best practices. You are starting fresh in a new home. Having a well-organized home will help things run more smoothly and efficiently from the beginning. View our packages below. Want to customize a package to fit your needs? Contact us and we're happy to help. Imagine going from a space full of stacked boxes with empty, shelves, cabinets and drawers to a fully unpacked and organized kitchen and pantry…ready to make coffee in the morning. The kitchen and pantry are the heart of almost every home. Let us unpack your kitchen and pantry the day of your move. You will feel at home the first night, and avoid spending extra money going out to eat the first week. Beginning with our customized questionnaire, your preferences will drive the systems we personalize and implement so you have easy access to the things you use the most. Using our signature organizing process, we systematically unpack and set-up your kitchen and pantry. 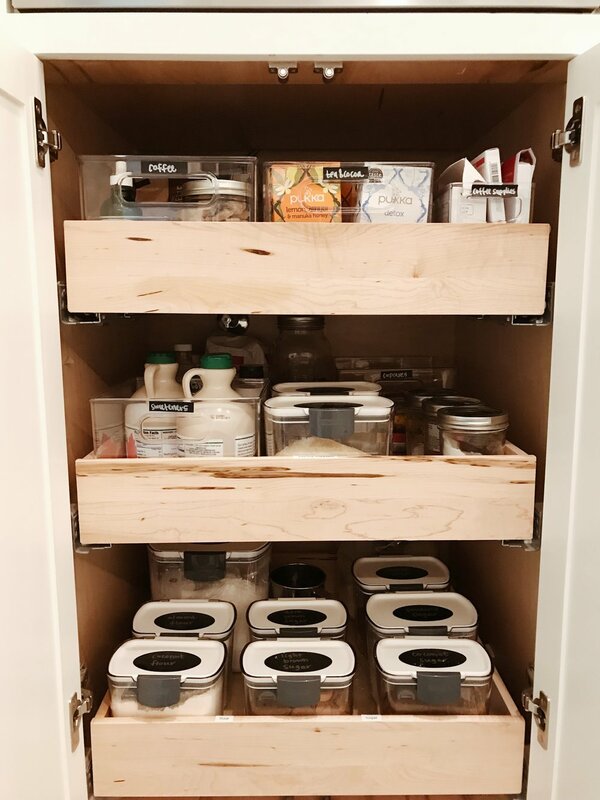 We create a labeling system to ensure your kitchen and pantry stay organized. We break down all boxes and packing materials. Imagine going from spaces full of stacked boxes with empty, shelves, cabinets and drawers to a fully unpacked and organized kitchen, pantry and master closet. The kitchen, pantry and master closet are the spaces we need well organized so we can live with less stress. Let us unpack and you will feel at home the first night and be able to easily get dressed in the morning. Want to swap out a different room to unpack and set-up? No problem! Just contact us for details. $100 of customized products from The Container Store® to create beautiful, functional systems in your new home.